SACRAMENTO REGION, CA (MPG) - On April 25 more than 70 members of American Legion posts throughout the state of California, along with members of the American Legion Auxiliary and Sons of the American Legion, spent an informative and interactive day meeting their legislators and sharing their concerns for the future of the more than 1.7 million veterans living in the Golden State. 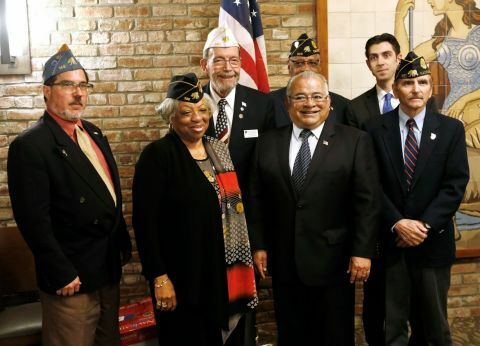 The American Legion is one of the largest veteran advocates in the United States. Sons of the American Legion (SAL) also exists to honor the services and sacrifices of those who served their country. Veterans Legislative Advocate Seth Reeb welcomed attendees with an explanation of the day’s events and kept the program moving as Assembly members and Senators from El Dorado Hills, Napa, Merced, Thousand Oaks, Riverside, Fullerton, Dana Point (Orange County), and Oceanside, many of them veterans themselves, explained the legislation they are sponsoring. Dr. Vito Imbasciani M.D., secretary of the California Department of Veterans Affairs and head of the CalVet Leadership Team, spoke of the tragic killing of three staffers by a former patient at the Yountville Veterans Home on March 10, 2018. The patient was in a special program for those suffering from post-traumatic stress disorder. SB1314 has been introduced to prevent this from happening again. Senator Bill Dodd (D-Napa), a member of the Senate Committee on Veterans Affairs, and Assemblyman Adam Gray (D-Merced) each received the Department’s 2017 Leo P. Burke Legislator of the Year Award for their leadership, support and dedication to the veterans and service members of California. Senator Ted Gaines (R-El Dorado Hills) is working on Senate Bill SB 1375 that would reinstate the “VETERAN” license plate, which will be available only to veterans. Gaines spoke of his father who at 18 years joined the Army Air Corps during World War II, serving on a tail gunner on a bomber in Germany. 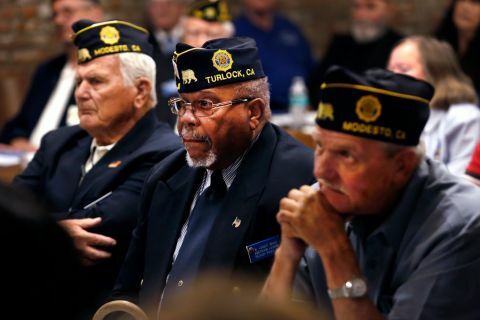 Assemblyman Jacqui Irwin (D-Thousand Oaks) and Chair of the Assembly Committee on Veterans Affairs described AB 2325, which would protect an eligible veteran’s ability to access county mental or behavioral health services. Senator Josh Newman (D-Fullerton), Chair of the Senate Committee on Veterans Affairs, explained his Bill, SB 1080, which would streamline the state’s driver licensing requirements for active duty military and their families so they can begin earning extra income from ridesharing companies such as Lyft and Uber without unnecessary fees and delays. Other examples of bills included AB 2394, which exempts military retirement pay from California state income tax, AB 2801, which addresses the problem of veteran and law enforcement memorials being vandalized, and SB 1452, which would establish the War on Terror Memorial Committee to look into the feasibility of the construction of a memorial in or around the State Capitol Park. Other proposed legislation addresses veteran housing, homelessness, issues with disabled veterans, and more funding for county veterans service officers from the current $5.6 million to $7 million. The American Legion (AL) and American Legion Auxiliary (ALA), both founded in 1919, exist to help veterans and their families. The AL is active in supporting the interests of veterans and representing on their behalf. According to the ALA, they are the world’s largest women’s patriotic service organization. Working side-by-side with their American Legion posts, members volunteer tens of thousands of hours in their communities and raise millions of dollars to support its programs.